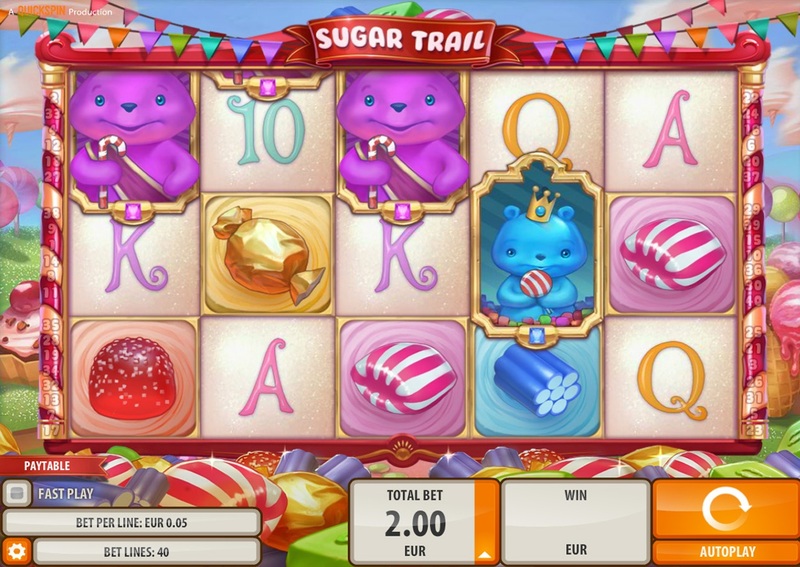 Sugar Trail slot from Quickspin is available online. Sugar Trail slot is a Quickspin video slot game, and it offers players five reels and 40 paylines, along with a total coin bet per spin of 40. The coin range is a wide enough one for the majority of players to be happy with, extending from 0.4 through to 100, and there are bonus rounds and multipliers available for play. Quickpspin’s Sugar Trail slot has a confectionary theme running through it, and it features three gummy bears that are able to unlock the three different bonus features available to players. The best of these is the wild candy free spins feature, since this one has flying wilds available: the wilds move around on the reels as this portion of play is accomplished, but remain available throughout. Many more free spins are also available during this part of the game. The graphics for Sugar Trail slot are cute and cartoony, all in keeping with the sugary slant pointed at in the title for the game. It is a celebration of all things sweet, and packs the reels full of treats in keeping with this motif: symbols include brilliantly coloured chocolate; various candy symbols and the standard playing card icons in use for video slots. The reels are set against a backdrop of a skyline filled with candy floss and ice cream. The three gummy bears are the player’s key to unlocking the three available bonus features for Sugar Trail slot. The purple king gummy bear is able to trigger the wild candy free spin bonus if it appears on the first; second and third reels. When this happens the player will be whisked off to the sugar trail, and both the amount of free spins and the total wilds applicable to the bonus will be determined here. Sugar Trail slot’s wild candy free spin feature includes flying wilds, symbols which are able to move around the reels after each spin has been completed. Once they become active they will remain available for play throughout the feature, moving to a new position with each spin. Extra free spins are available, and will be added to the player’s account each time the +1 free spin icon lands on the reels. The queen gummy bear, coloured green, is able to appear on the second, third and fourth reels, and, when this occurs, will activate the sugar lock respin feature. A spin of the sugar trail will determine the number of locked wilds and spins the player is able to make use of, with the former remaining in place for the duration of the feature. The prince gummy bear, coloured blue, appears on the third; fourth and fifth reels, and he is the key to a selection of multipliers and cash bonuses when he lands where he should. Sugar Trail slot is low variance game, so players are able to get plenty of game time for their money. The good features and adorable graphics make for an enjoyable slots experience, and the bonus options allow for players to put some extra money in the bank.